Visit the Events Manager by selecting it in the app menu or by visiting the Dashboard and selecting it there. Edit or delete an event with the icons (D) at the far right. You also can edit an event by clicking its title (E). Return to this page by clicking VIEW ALL EVENTS (H) from any page within the app. Click NEW EVENT from any page in the Events Manager app. Enter the EVENT TITLE, which will serve as the URL of the event page. Keep the EVENT LIVE slider in its default position to publish your event. Click it to hide the event from public view. 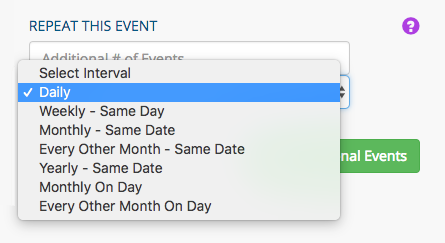 Click DUPLICATE THIS EVENT to create an exact replica of this event (you must save your event before making a duplicate of it). 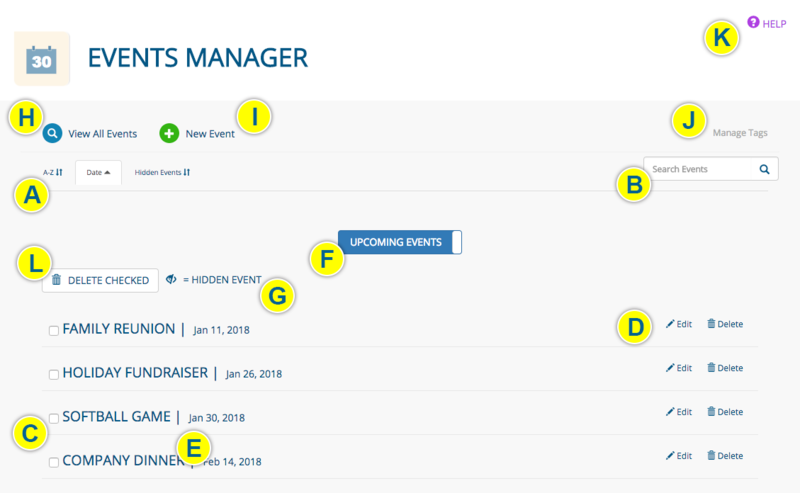 Duplicated events will appear on the Events Manager home page. Set the EVENT SCHEDULE. 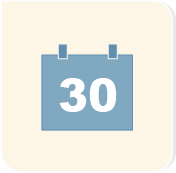 The FINISH date must on the same day or after the START date. The finish time indicates when the event will be taken down from your website. If your event has an actual finish time, you should include it with the rest of the event details in the page editor. 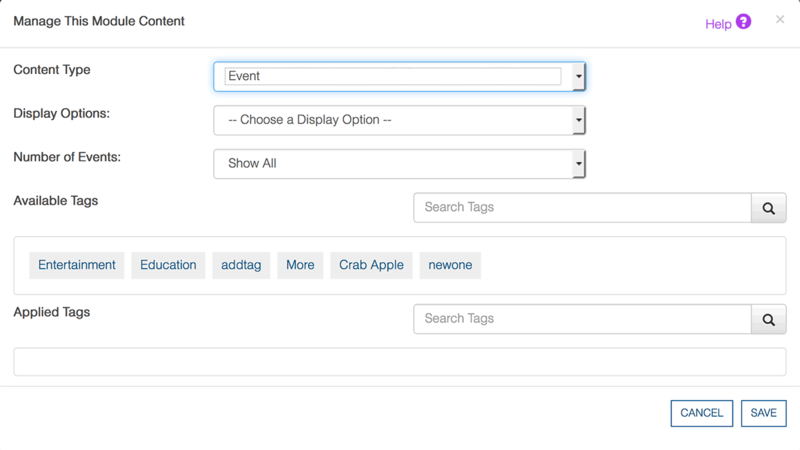 Click a tag in the AVAILABLE TAGS field to assign it to the event. Click a tag in the APPLIED TAGS field to unassign it. Choose an EVENT THUMBNAIL. This is the image that will be used when users share this event on social media. 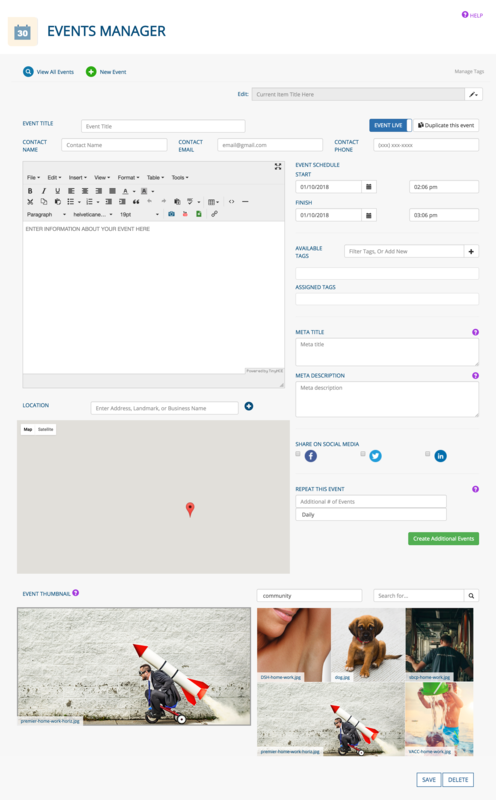 It also will be used if you opt to show images with event summaries. Select the appropriate folder from the dropdown menu that contains an image that represents this event. Click the SAVE button when you are finished creating/editing your event, or the DELETE button to delete it.